Just had to share...this is really amazing! Kit and Clowder are celebrating reaching 10.000 members and are giving their brand new Markers 101 Online Coloring Class for free! I haven´t yet watched all the lessons included, there are so many lessons to watch, but what I have seen so far is truly worth sooo much, Alyce is the best instructor and teacher and is so easy to follow and understand. You will learn a lot about light source, color theory, blending and more! I have not taking any of her classes before, mostly due to lack of time, but a few of them are on my whish-list! I can´t wait to take the Clothing technique class and the Skin and hair technique class! I have been playing with happy, smiling umbrellas today! As you can see I applied a thick coat of Glossy Accents to make them nice and shiny! At first I thought of masking their eyes and mouths, to get "regular" umbrellas, but I went for the happy smiling versions instead, and I´m glad I did as it turned out to be a happy-hello-card! The umbrella and the tiny heart are from the clear stamp set "Plus One", by Lawn Fawn, the word hello is from this super perfect clear stamp set "Big greetings", by Avery Elle. Love it, love it, love it.....big beautiful words including celebrate, happy birthday, hello and thank you! The umbrellas are colored with Copic markers! I colored this little lizzard for day 13 of the 30 day coloring challenge. I then decided to to put him on a card, it took me quite a while deciding what patterned paper to use and matting the solids, measuring it all up... Then I thought something was missing on the almost finished card...oh, of course, lets stamp a sentiment! The word happy is from a clear stamp set ( can´t find the name) from Avery Elle and the word birthday is from the clear stamp set "Birthday" by KaiserCraft. But the word birthday is also a part of a sentiment stamp saying " A birthday is the first day of another 365 day...." and I did only want use the word birthday by covering the other words up with scotch tape, (as I have done several times before! ), and as I did when I did a test run. But when It was time to do the stamping on my actual card all thoughts about not dry enough stamp, wet ink, smeering and so on totally disappeared... and when I removed the stamp and saw this...I was not a happy camper for a long while, until I finally came up with a solution to fix my mistake. I tried different ways to hide my mistake, and finally I came up with the idea of stamping the happy birthday greeting on a banner, and the result is sort of clean & simple! The lizzard is a $1 stamp from Michael´s, purchased years ago, the balloon is from the clear stamp set "Wonderful" by Penny Black, all images are colored with Copic markers. A coat of Glossy accents is applied on the balloons to get them nice and shiny! Day 3 of the "Heat Wave" class by Online Card Classes! On today´s card I put some shine and glitter, by embossing the edges of the light blue cardstock by smearing on Versamark Ink and adding turquoise/black embossing powder from Ranger and heat set it. On the sentiment strip I used the same technique as yesterday, using doublesided tape and embossing powder and my heat tool. This little fairy frog stamp is also from C.C Design, purchased long ago though. The sentiment stamp is from the clear stamp set "Soiree", by Mama Elephant. I colored him (!) with Copic markers, applied some Wink of Stella on his wings to make them sparkle and I also put small foam dots underneath the wings to give them some dimension. Now its time to clean my desk and try to get rid of all traces of embossing powder! 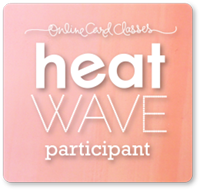 Day 2 of Online Card Classes "Heat wave"! I did not know that you could use double sided tape together with embossing powder and heat emboss...so I followed Jennifer´s tips and tried it! I used two different widths of double sided tape as I thought the thinner one would look too thin for the bunnies to sit on. I heat embossed the word hello, (from a clear stamp set of which I can´t find the name , but it´s by Avery Elle), and I added three dots with a Versamark Embossing pen, added some more embossing powder and heat embossed again! The bunny stamp is an older one from C.C Designs. The bunnies are colored with Copic Markers. I used a Copic marker to color the edges of the bunnies (as the black marker I usually use for that has run out of ink), I knew that it would possibly bleed onto the paper, and it did, you can see small blothes if you look closely, but I think it´s ok as the bunnies are darker and lighter all over! Today is the first day of the new class Heat Wave, a class focusing on heat embossing, hosted by Jennifer McGuire and Kristina Werner on Online Card Classes! On this card I have been working with Yana Smakula´s technique tips #7, to heat emboss an image colored with Copic markers. I stamped the images and colored them with Copic markers. I then masked the little penguins and colored the grass and the blue sky using Distress Inks by Ranger. To make sure that everything was completely dry, I used my heat tool, before stamping the images again, right on top (using a Stamp A Ma Jig Stamp Positioner). For the top layer I used Versafine Onyx black to intensify the image outline, I added clear embossing powder and heat set the images again! It really did make a difference, as you now can see the shiny outlines! I die cut a tag, using "Embellished tag", by Mama Elephant. The polka dotted tag I cut out free hand as I wanted it to be a little bigger. The sentiment stamp is from the clear stamp set "Soiree", by Mama Elephant. the little penguins are from the clear stamp set "Love Quotes", also by Mama Elephant. Day 6 of the 30 day coloring challenge hosted by Kathy! This is my first time taking part in this challenge I have heard and read about for so long! THE GOAL IS: To color something daily even if it’s a few minutes. BASICALLY it’s any thing goes challenge. Today I chose to color some flowers, the stamp I have used is a background stamp by Hero arts called "Large flower background". I did ink up the entire stamp but decided to only use parts of it. I colored three diffrent flowers, cut them out and then assembled them together in a new way! It´s a little hard to tell but if you look closely you can see the shimmer on the petals as I have applied a coat of Wink of Stella in color clear! The pink background is colored with Distress Ink, the flowers are colored with Copic markers and the sentiment stamp (meaning Happy birthday) is from Gummiapan. Please head over to my Instagram account tina.mypop to see what else I´ve been coloring for this challenge! I am for the first time participating in the 30 Day Coloring Challenge which started yesterday, hosted by lovely Kathy! The goal is to color something daily even if it´s just for a few minutes! And I will definitely try to do that, I might not be able to do it every day but as many as I can, during some ME-time! So, this is day 2 and I have done a little coloring and a card! This cool chick is from the stamp set "Going places", by Moonlight Whispers and Kraftin´Kimmie Stamps. The image is colored with Copic markers and the background with Distress Inks by Ranger. Heat embossing & bubble bath! I made a birthday card to a special person and at the same time I`ll take the opportunity to submit it to the Wonderful Wednesday Challenge over at Kraftin´Kimmie Stamps as the theme is ANYTHING GOES! I have colored "Suzette", by Moonlight Whisper and Kraftin´Kimmie Stamps, using Copic markers. I have added some faux stiching/dash lines along the die cut circle and Glossy accents to the bubbles in the bath, to create some interest and details on this CAS card! This happy die from Avery Elle is heat embossed with embossing powder by Ranger, what makes it special is that the turquoise embossing powder is mixed with a tiny amount of black powder! To get some dimension I heat embossed it several times, adding a new layer of embossing powder every time!